TimeLogic annouces a new accelerated short read mapper for aligning data from next-generation sequencers. VelociMapper® outperforms BWA, Bowtie, and other mapping tools. Contact TimeLogic for free performance benchmarks. FORTY 32 CPU-Core servers in a single DeCypher server. No other accelerator technology can even come close. Contact us for more information or your own performance benchmarks. TimeLogic's high performance biocomputing technology offers a superior price to performance ratio than alternative Cluster, GPU, or Cloud computing options. For over 20 years, our DeCypher product line has been cited annually, exceeding 190 peer-reviewed publications. Check out our citations page to see how other scientists are using our products. more details or customer references. DeCypher® biocomputing systems accelerate sequence comparison by combining optimized bioinformatics applications with powerful Similarity Search Engine FPGA-accelerator cards. A single DeCypher server can provide the performance equivalent of hundreds of CPU cores. 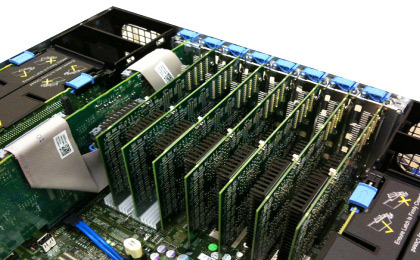 Using our hardware-optimized versions of BLAST, Smith-Waterman, HMM profile search, and gene finding algorithms, you can run sophisticated high-throughput comparisons that are too large for public resources and too time consuming to run on local CPU clusters. DeCypher offers the best price for performance compared to alternate technologies, including GPU accelerators and cloud computing. TimeLogic systems provide faster results, better reliability and lower operational costs for annotating novel sequences and assemblies against rapidly expanding genomics data resources. As a leader in discovery research for over 15 years, TimeLogic systems have been used to annotate some of the earliest sequenced genomes as well as the largest and most ambitious metagenomics efforts. From R&D proof-of-concept to next-gen production pipelines, DeCypher's systems can be scaled and customized to meet any computational burden. Multiple accelerated nodes can be clustered for supercomputer-level performance. The latest DeCypher software release makes available the core admin module. Exciting cost-recovery accounting features can streamline your genomics core by allowing you to pass along DeCypher's low cost of operation to your internal customers. All Content Copyright © 2019	Active Motif, Inc.